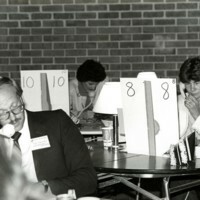 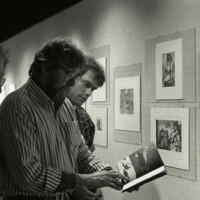 Photos documenting the history of UW-Parkside. 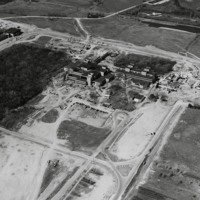 Aerial view of Wyllie Hall, Greenquist, and physical education building. 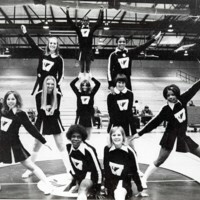 UW-Parkside cheerleaders pose for a photo. 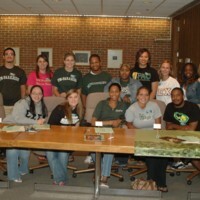 Group of students from various organizations pose for a photo. 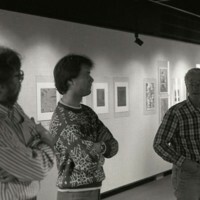 Steven Vasy, Doug DeVinny, and Glen Larson page through the catalog for the UW-Parkside National Small Print Exhibition. 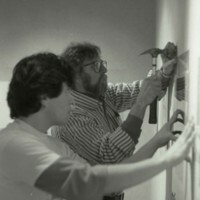 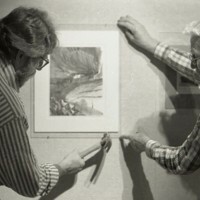 Doug DeVinny and Steven Vasy hang art for the UW-Parkside National Small Print Exhibition.